Level headed Michael Bluth (Jason Bateman) is hoping that his overbearing father George Bluth Senior’s (Jeffery Tambor) retirement means he will take over the reins of the family company. He doesn’t George Sr. handing the reins over to his wife Lucille (Jessica Walters) – much to Michael’s disgust. Before Michael can leave the family for good however George Sr. is arrested for fraud and Michael must take the reins as head of the family, in order to save not only the company, but his spoilt clueless family as well. And so begins Arrested Development, the premise seems simple enough, but it soon becomes one of the most complex, rewarding and hilarious television shows created – narrated with flair by an uncredited Ron Howard. The Bluth family is not your average family, Michael and son George Michael (Michael Cera) being easily the sanest of the bunch. The Bluth family comprises older brother and amateur magician Gob (Will Arnett), sheltered youngest brother Buster (Tony Hale), Michael’s twin sister Lindsay (Portia Derossi) and her husband, former psychiatrist turned “actor” Tobias Funke (David Cross), their attention seeking daughter Maeby (Alia Shawkat). Not to mention the 4 siblings controlling, vindictive and alcohol loving mother Lucille and of course jailbird George Senior who spends much of the season behind bars, or trying to escape. There are other family members but to reveal anymore would spoil many of the surprises of the series (if not the first season then subsequent seasons). The first season deals with Michael’s attempts to get the family business back into the black, and his father released from jail. All the while he must fend off the machinations of the rest of the family, all eager to hold onto the life they have become accustom, and who constantly rely on Michael for support – and money. Any summary of the show is not going to do it justice as the layers of jokes and humour is like nothing else on television, throwaway one liners become important plot points, jokes constantly reoccur mean multiple viewings are constantly rewarding the viewer making Arrested Development a rich viewing experience. Whilst the writing is without a doubt Arrested Development’s strongest point it is nothing without a stellar cast. Special mention must also go to Jason Bateman who who holds the show together as straight-man Michael Bluth; bringing some form of grounding or normalcy to the proceedings. Arnett as Gob the amateur magician and jealous older brother and Cross as maybe gay “actor” Tobias are easily the funniest and most memorable of the cast, their comic timing pivotal in bringing their characters to life. The main cast are only complimented by memorable side characters played by a vast array of guest stars including Judy Greer, Liza Minnelli, Carl Weathers and of course Henry Winkler as the Bluth’s incompetent and increasingly homosexual lawyer Barry Zuckerkorn. 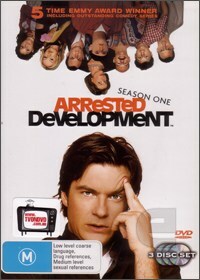 In Arrested Development a top notch cast meshed with superior scripts, which range from the ludicrous to the sublime, to create one of the most laugh-out loud and at the same time deeply subtle television comedies; Arrested Development is without one of the finest television programs ever put to air. As such it is a travesty that only 53 episodes were ever created, 22 of those being presented on the Arrested Development Season 1 DVD set. Special features include audio commentaries, behind the scenes featurettes and a series soundtrack. A sensational package for a sensational show – BUY IT, RENT IT, JUST WATCH IT!